Moose Hollow Condos Location. Luxury condominiums and town-homes. 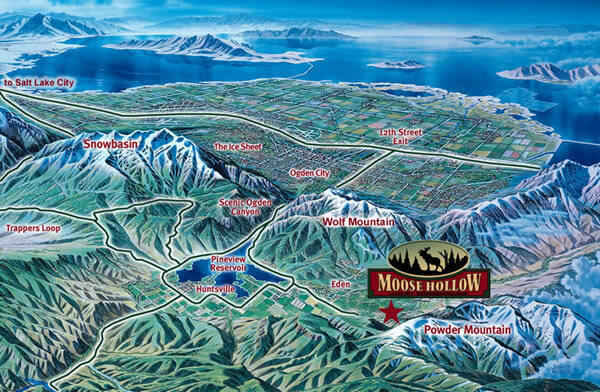 You will find Moose Hollow in the center of the beautiful 2,465-acre Wolf Creek Resort, approximately 60 miles from Salt Lake City International Airport. The closest major city is Ogden. From the airport, go North on I-15 to Ogden, head East up 12th Street (Exit #344) to Ogden Valley. Turn Left at the dam and follow signs to Powder Mountain, Wolf Creek Resort and Moose Hollow.